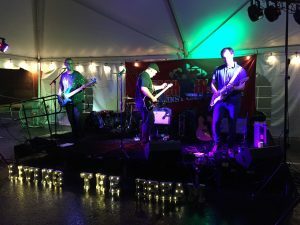 The rain and the wind, lightning, and thunder did not daunt those who attended the annual event at Turf Valley Town Center to benefit Zaching Against Cancer. My friend Betty and I sat in our respective cars for a half hour waiting for it all to subside enough to make a run for it. Well, it did, and we had a marvelous time, as usual. Petite Cellars, our favorite wine store, has been the site of the event for several years. 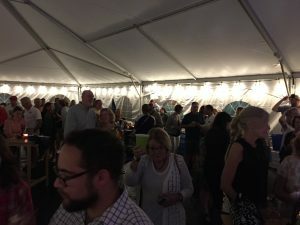 Businesses from the center, to include Harris Teeter, Smyth Jewelers, Grille 620, Pinot’s Palette, and others, have donated food, fun, raffles, and provide wine tastings throughout the evening. Music fills the tent, rain or shine! Zach Lederer’s family is out in force, and if you don’t know them personally, you will by the time you leave the event. And, when you attend the following year, they remember you. The funds that are raised support the foundation, which provides scholarships, and assistance to those battling cancer. I have to share that today marks my 33rd wedding anniversary of marriage with my darling Jim. Our life was invaded and taken by cancer. I did not reach out to Zaching or the Little Things for Cancer, given the extraordinary support I have from my family and friends. But, not everyone has that support system. Carol Flock, who is the patient care specialist, makes miracles happen for people, with the support of those who support the cause. For more information about Zaching Against Cancer, visit www.zachingagainstcancer.org.